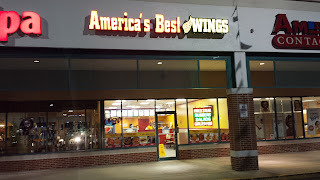 It's an America's Best Wings! Don't we already have one of those in Bowie? Yes, we do. And I've dubbed them "Bowie's Best Wings," so I don't know how to feel about the addition of a second location. On the one hand, more of a good thing is good. On the other, does it make the "original" location less exciting? I think "more of a good thing" is the correct reaction. And, hey, did I only give it 3.5 stars? That doesn't match up with how often I've been visiting it. Let's upgrade it to four! So is this location more of the same? Yes and no. It's the same basic thing, but there were some menu differences. They don't have a "medium" wing flavor (they directed me to "mild" as the same thing). They don't charge 50 cents per refill on sodas (probably because they're not in walking distance from Bowie High). And they have a kids' menu. (My kids got along fine at the other location, however.) I'll declare it an upgrade. The service, however, seemed more brusque. The servers at the other location had been very nice. Here, when I asked whether my wings came with blue cheese (I knew they did, but it wasn't offered to me), the guy said, "I give you one." So...I think your choice of location is determined by where you are in Bowie, but I'll stick with the Free State location as my favorite. Still four reviews to go! Uno Chicago Grill is now closed. The Bowie Marketplace is coming along. I think the Firehouse Subs, Chick-fil-A and Chipotle had been announced, but this is the first I've heard of the MOD Pizza.